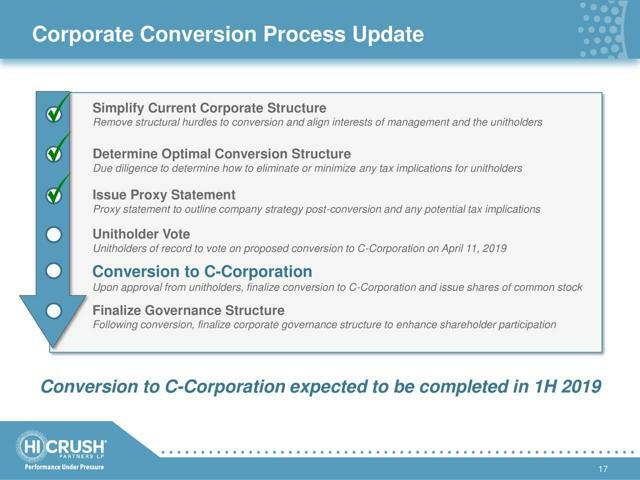 C-Corp conversion will be a game changer for Hi-Crush as the new corporate tax laws offset past MLP benefits. Q1, 2019 results should be much better than Hi-Crush's disastrous Q4, 2018 results. 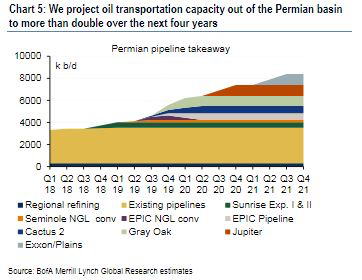 Permian bottlenecks should start to clear up in the second half of 2019 as additional capacity comes online. 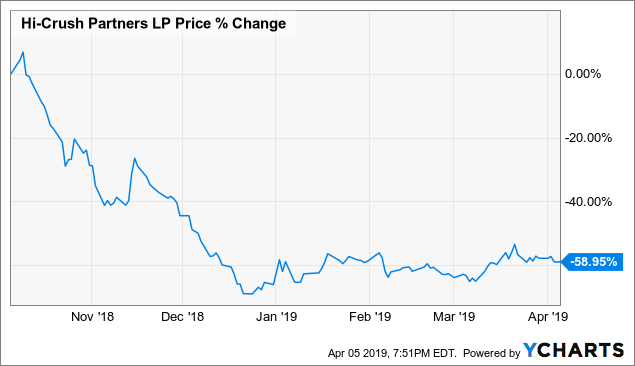 It's do or die time for Hi-Crush Partners LP (HCLP) as its unitholders vote on a C-Corp conversion from a MLP is coming up on April 11, 2019. Regardless of the vote outcome, Hi-Crush's upcoming Q1 results are forecasted to be much better than its disastrous Q4 results as their appears to be a small rebound happening in pricing and volumes in the Permian Basin. The Permian pipeline bottleneck should start to clear up in the back half of 2019 allowing takeaway prices to rise to more normal levels as E&P customers should still have decent spending budgets in place at the end of 2019 after the slowdown in the first half of the year. Management is bound and determined to convert Hi-Crush from a Master Limited Partnership MLP to a C-Corp after corporate tax rates were reduced after President Trump's election. With management's full backing, a conversion from units to shares of common stock should be taking place in the near future as the company is ready to move on from its former corporate structure. Management's long-term views have been less than desirable for short-term unit holders as buying out the former general partners in October of 2018 caused a substantial 11 million unit dilution, which resulted in a substantial drop in unit price over the rest of the year as the former general partners apparently moved on to other interests. C-Corp conversion should provide benefits such as easier access to capital at better rates as Hi-Crush would be more organized toward long-term success instead of focusing almost solely on distributing profits each and every quarter on distributions and unit buybacks based on performance. Of course, this potentially means that investors should expect a more conservative long-term future dividend similar to competitors at 1%-4% instead of the 6% or even 20%+ distributions Hi-Crush had experienced in recent quarters to potentially force out the general partners or when profits were outstanding before the most recent crash in pricing and volumes for many sand companies. Retail investors could also be more interested in the stock as well moving forward as K-1 tax forms associated with MLP's can be off-putting for investors not interesting in filling out additional tax forms. Hi-Crush's disastrous Q4 report included a loss of almost $10 million compared to a gain of over $27 million in Q3 income as Hi-Crush's contribution margin on sand shrank to $14.35 per ton from $23.92 per ton in Q3, 2018. Volumes also shrank close to 30% from the prior year's quarter from 2.77 million tons to 1.97 million tons. 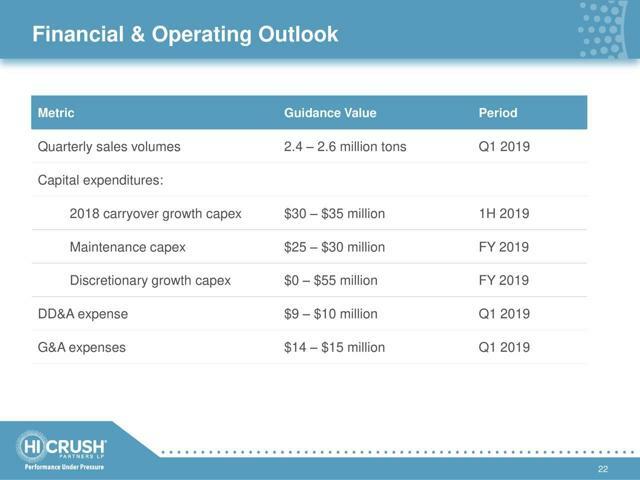 However, things are looking up for Hi-Crush's upcoming Q1 quarter as guidance is projecting selling between 2.4 - 2.6 million tons of sand as the company ramps up its Kermit 2 facilities along with additional volumes from its Northern White facilities. Combine this with a modest rebound in frac sand prices according to St. Louis Fed Producer Price Index for Hydraulic Fracturing Sand and you have a recipe for a nice rebound in stock price after the following quarter if conditions continue to play out how management and the data are predicting. Finally, one of the main reasons why times have been tough for Permian Basin sand companies over the course of 2019 is the pipeline bottlenecks the area is currently experiencing. These bottlenecks are resulting in oil that can't be easily taken away from the Permian, but instead are stuck in the Permian unless it is sold at prices at ~$20 a barrel cheaper than the current spot rates. However, takeaway capacity out of the Permian is expected to more than double over the next few years as new pipelines come online to help correct the current situation. All of these events should help Hi-Crush rise from the ashes like a phoenix in the back half of the year. Ending the uncertainty associated with an MLP to C-Corp conversion along with sequential volume and pricing increases should help propel the company's stock higher based on fundamentals. Hi-Crush might even get an extra boost if the forward looking market gives the upcoming pipeline expansion the benefit of the doubt in fixing pricing pressure sooner rather than later. I continue to be long HCLP with an oversized position in my portfolio as I have averaged down my unit price as I continue to believe the opportunity over the next 5 years for the company is still potentially very strong. My price target for the end of 2019 is a return to $9 a share. Best of luck to all. Disclosure: I am/we are long HCLP. I wrote this article myself, and it expresses my own opinions. I am not receiving compensation for it (other than from Seeking Alpha). I have no business relationship with any company whose stock is mentioned in this article.